"They are beautiful!! Thank you!!" "Thank you so much for the beautiful arrangement! Your flowers and floral designs are always gorgeous!! And the agents on the phone are always very helpful!!" "This is what you would expect when you send flowers &#127802; It made her dayoo"
"Beautiful. Carole will love it. Great idea sending a picture." "Flowers of Fort Lauderdale took the time and had the knowledge to find exactly what was fitting for my situation. They do beautiful work. I would recommend them to everyone." "This looks nothing like the picture- not even close. Very disappointed." "Very pleased with the planter, and your very gracious service. Thank you again." "Love getting a picture of the flowers delivered. Thank you!" "Great idea for letting your customers see the actual arrangement being shipped. Thank you!" "They look great! I loved getting a photo! Thanks!" 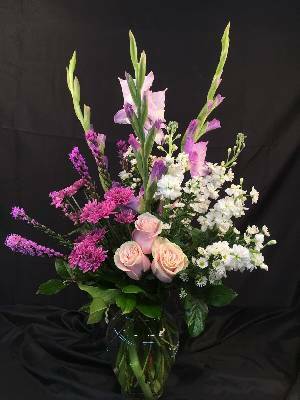 "Great service and beautiful arrangement! Thank you!" "My mom loved her flower arrangement. Thank you for delivering it on time!!" "Thank you so much. They are very pretty. I really like the arrangement." "Appreciate receiving a photo of order!" "This my second order and have been very pleased. This is the old fashioned "customer first" way of doing business." "This is the first time I have been disappointed in the arrangement. what was shown on your website and what is presented here in the picture is no where near what I thought I was ordering. at this point if this is what was sent there is nothing that can be done, but to say the least I am very disappointed." "Thank you so much! It is as nice as you said it was!! We are very thankful!" "My children and I ordered 2 of these baskets for my husbands funeral. They were placed on each side of the altar steps. They were absolutely beautiful. The picture does not do them justice. Thank you Hoelck's. Perfect!" "Fantastic job on the arrangement and love being able to see a picture of what will be received!"